30 years ago my mum was "Patches The Clown" catering for kids parties. 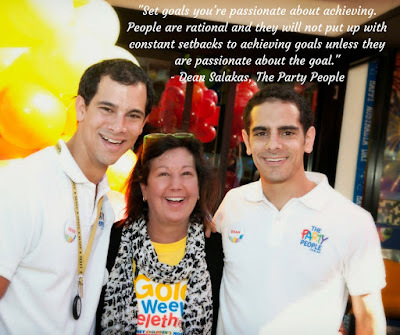 Her passion for parties led her to start a small party store. In 2007 my brother and I took over the family business and its 2 employees so my parents could retire. We have approximately 40 employees and are the market leader for party supplies online. We are now in the process of getting investors on board to expand our retail store network. 2. How did you identify the goal/s you wanted to achieve? We had a vision and that was the to be the market leader online in Australia. Everything we did was to work towards that vision. 3. How did you work towards achieving your goal – did you have a plan and a deadline to achieve your goals? In the beginning there was no plan. Innovating online came easy to us with minimal effort so we just focused on meeting growing demand. Then as we grew we started running out of capacity and that’s when failing to plan really hurt us. We had a year where we were unable to cope with demand so my brother and I were working 18 hrs a day every day of the week with minimal sleep to keep up. Our social lives and health suffered and from then we learned how to plan better. From then on we have financial plans and forecasts which we catch up to discuss monthly. 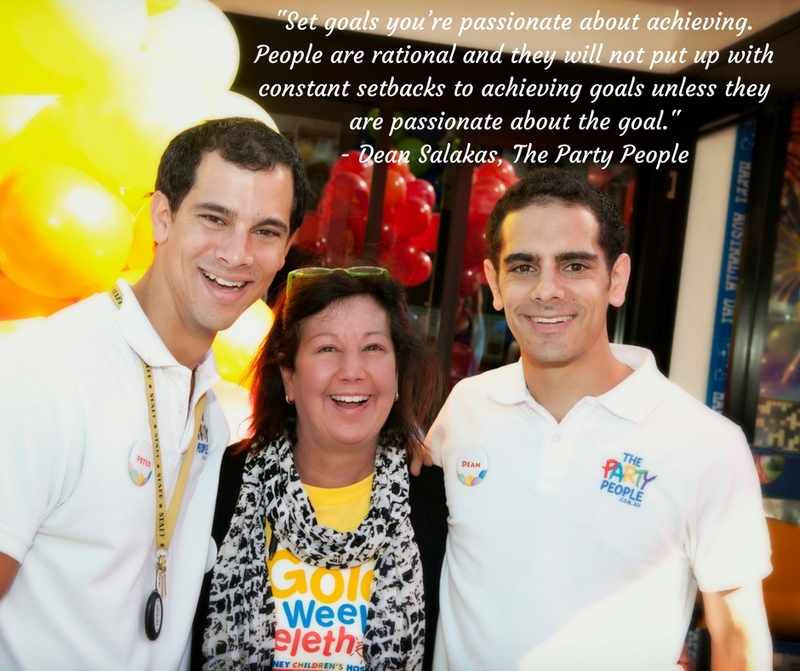 Dean (above left) and Peter Salakas (above right) are the Owners of The Party People. The business was started by their mother Mala Salakas(middle in photo) and Grandfather Peter Nikolas. 4. What was the biggest challenge you encountered along the way? Our biggest challenge was the number of hours we were working to keep the business running. It was at that point we realised we needed to delegate more, but it wasn’t possible with the systems and processes we had in place so we had to improve our systems and processes to ensure things could run without us. 5. What inspires you and keeps you going when you encounter obstacles? I love what I do and we have an amazing opportunity to create a national chain of party stores. Our vision to achieve this is what keeps us pushing towards our ultimate goal. 6. What advice do you have for anyone wanting to achieve a goal? Set goals you’re passionate about achieving. People are rational and they will not put up with constant setbacks to achieving goals unless they are passionate about the goal. 7. What are the next goals you hope to achieve? We would like to open up one party store next year and two the year after that.